Bow Road has, I fear, reached peak Cycle Superhighway. It'll all be worth it eventually, we're assured, creating world-class segregated lanes and a step change in cycling provision. But when TfL do finally get round to trumpeting the successful completion of this flagship project, you need to know how miserable living through the Cycle Superhighway's upgrade has been. 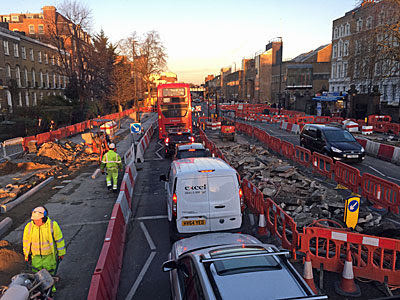 So below is a record of CS2 roadworks on Bow Road as they stand in the middle of February 2016. The table runs from just past Mile End (at the top) to the Bow Roundabout (at the bottom). Cycle Superhighway 2 follows the two blue columns to either side, while road traffic runs down the middle. Black text shows normality, while red text shows roadworks. If you'd like to experience how difficult things are for cyclists, try following the last column downwards, or the first column upwards. And for your own safety don't try the journey in real life, not for a couple of months yet.